Young adults today are less likely to move than they were in previous generations. Data from the Census Bureau shows that the mobility rate for young adults is at the lowest rate it has been at in 50 years. But what about the millennials who do move? They offer an economic boon to the cities and states who receive them. Below we rank the cities and states where millennials are moving. Thinking about buying a home in a new city? Check out current mortgage rates. In order to find the places where millennials are moving, SmartAsset analyzed immigration and emigration data from the Census Bureau for 2015. We compared the number of persons between ages 20 and 34 moving into a city and compared it to the number moving out of a city. Check out our data and methodology section below to see where we got our data and how we put it together. The Big Apple losing its appeal? – New York City saw the biggest loss in millennials. According to our data, New York lost over 29,000 millennials, placing it at the bottom of our list. Other big cities also appear at the bottom of our list. The six cities which lost the most millennials are New York, San Diego, Miami, Houston, Las Vegas and Chicago. 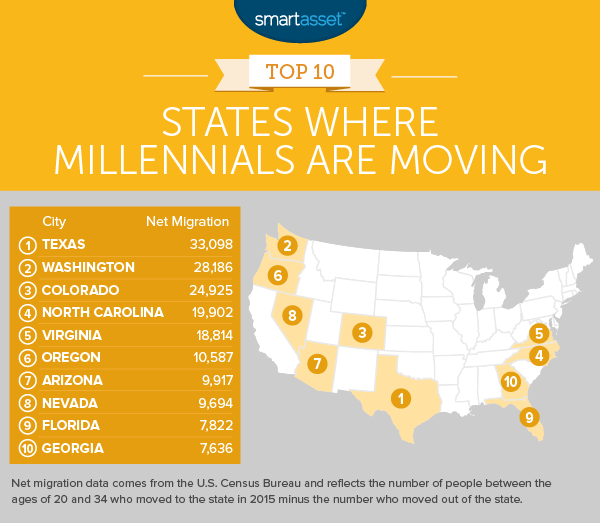 Leaving the Midwest – The Midwest has no representatives in our top 10 states where millennials are moving and only two representatives – Fargo, North Dakota and St. Paul, Minnesota – in the top 10 cities where millennials are moving. Are millennials leaving the Midwest? Ohio and Michigan, for example, both rank in the bottom 10. When we analyzed trends in retiree mobility, we noticed retirees tend to head to places where they can shelter their retirement incomes from taxes. The movement patterns for millennials follow a similar theme, except instead of protecting their money they are trying to earn some. Four of the states where millennials are moving in the largest numbers (Texas, North Carolina, Colorado and Florida) are also states which have some of fastest-growing economies. These states are home to some of the biggest boomtowns in the country. Many millennials headed to specific cities rather than to states in general. Washington, Nevada, Virginia and Oregon are all examples of this phenomenon. Each of these states cracked the top 10 thanks to the popularity of one specific city. In Washington’s case it was Seattle, which was responsible for over 35% of Washington’s increase in millennials. For Virginia it was Norfolk, where over 38% of Virginia’s new millennials ended up. In Nevada, of the 9,694 millennials the state gained, 5,347 went to Spring Valley. But Oregon and Portland may be the best example of this relationship. Over 35% of the millennials Oregon gained, went to Portland. That is almost three times higher than the next-highest city in Oregon. Charlotte, the biggest city in North Carolina, saw a larger influx of millennials than any other city in our study. Overall our data shows that about 71,240 millennials moved to Charlotte while 60,533 moved out. That’s a net gain of 10,707. The largest net gain on millennials coming to Charlotte came from interstate movers. Around 18,000 millennials came into Charlotte from outside the state of North Carolina, while only about 10,000 left Charlotte for another state. Seattle is a popular destination for millennials. Overall our data shows that 86,641 millennials immigrated to the city, while 76,755 emigrated from the city. This left Seattle with a net gain of 9,886 millennials, the second-most in the country. It makes sense that millennials are heading to Seattle. This is a fun city with a vibrant economy. We recently rated it as one of the best cities for recent college grads. Oakland is another popular landing spot for millennials on the move. Unlike some cities, the largest net increase in millennials coming to Oakland came from residents moving from another county in California. In total 8,771 millennials came to Oakland from another county in California, while only 5,052 left Oakland for another county in California. Norfolk, Virginia is the fourth-most popular spot for mobile millennials. This city has a strong economy, bolstered by the large presence of the U.S. Department of Defense, which may be one reason millennials are flocking here. Overall around 7,000 more millennials came to Norfolk than left, a figure which represents almost 3% of Norfolk’s total population. If we were measuring the number of millennials coming to a city as a percent of the overall population, Fargo would be even higher up the rankings. According to our data, Fargo gained just under 6,000 millennials from 2014-2015, just over 5% of the total population. One thing which may be attracting millennials to Fargo is the area’s low unemployment rate. Spring Valley saw a net increase of 5,300 millennials. A large chunk of these millennials – 2,985 – came from out of state. At the same time only 785 millennials left Spring Valley and headed out of Nevada. In terms of raw numbers, this city saw less movement when compared to others in the top 10 due to its smaller population. About 13,546 millennials immigrated to Spring Valley while 8,199 emigrated. Both those figures are the lowest in our top 10. One plus for millennials coming to Spring Valley is that Nevada has relatively low taxes. San Francisco was one of the busiest cities we analyzed. Overall about 120,000 millennials moved in or out of San Francisco, with about 4,800 more coming in than leaving. Unlike Oakland, where the majority of incoming millennials were coming from other counties in California, the vast majority of the net increase in millennials in San Francisco came from out of state. 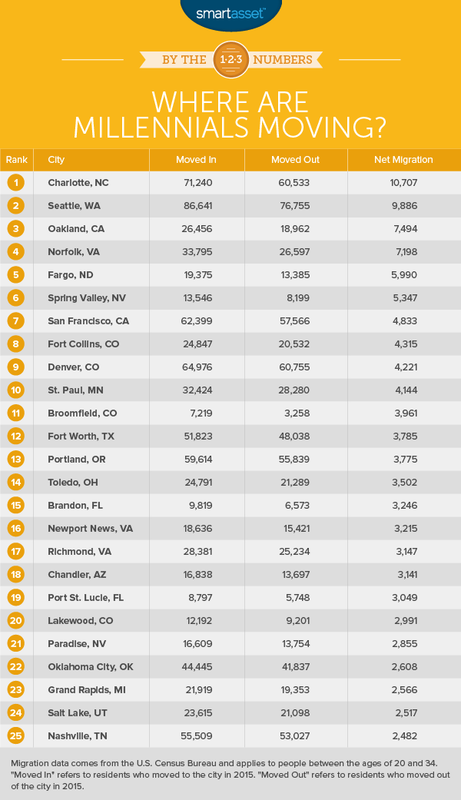 Fort Collins is the first of two Colorado cities to crack our top 10. This city has a booming economy with an unemployment rate around 2.9%, which has led to a large influx of residents. In fact, the housing supply grew 8.9% from 2014 to 2015 just to keep up with the demand for housing. Overall more than 4,300 more millennials moved to Fort Collins than left. Denver is a very popular spot for millennials. Our data shows about 4,200 more millennials immigrated to Denver than emigrated. That is the equivalent of about 0.63% of the total population. Most of the net gain in millennials came from the steady stream of out-of-state millennials pouring into the city. According to our data, about 6,500 more millennials came to Denver from out of state than left Denver for another state. St. Paul takes the final spot in our top 10. The smaller of the Twin Cities saw a net increase of about 4,100 millennials which just beat out Broomfield, Colorado for 10th place. Most of the net gain in millennials came from the difference between the number of millennials coming to St. Paul from out of state compared to the number leaving St. Paul for another state. In order to calculate which cities and states millennials are moving to, SmartAsset analyzed 2015 U.S. Census Bureau migration data on 218 cities and all 50 states, plus Washington, D.C.
We compared the number of persons between the age of 20 and 34 who left each city and state to the number who moved in. We ranked the cities and states by highest net gain in persons ages 20 to 34. Data on migration patterns comes from the 2015 U.S. Census Bureau’s 1-Year American Community Survey. Buying a home is a big decision and it can be difficult to know when it’s the right time to do so. Purchasing home comes with very high upfront costs, like closing costs and appraisal fees, that renting doesn’t. Let’s say you’ve been saving for a while and you have a nice nest egg built up. How do you know it’s the right time to change from renting to buying? One thing to consider when deciding if you should rent or buy is how long you plan on sticking around. Buying a home is much more time-consuming than finding a place to rent. If you plan on staying in a place for a short time, you may prefer to rent but if you’re in it for the long haul, it could be a good time to buy. There are also monetary considerations. Are home prices rising faster than rents? In that case you may lean toward buying. Do you have a bad credit score? You may want to hold off on buying a home until you can raise your credit score and can get approved for a better mortgage rate.